Fergus is the largest community in Centre Wellington, a township within Wellington County in Ontario, Canada. Fergus was an independent town until 1999 when the Township was formed by amalgamating Fergus, the Village of Elora, Ontario and the Townships of Nichol, Pilkington, West Garafraxa and a part of Eramosa. Fergus is best known for the annual Scottish Festival and Highland Games, held in August. The games represent the largest gathering of clans in the world outside Scotland and Cape Breton Island. Competitions are held for music, dancing and ‘heavy’ events such as the caber toss. A 10 km (6.21 mi) run is also contested. The organizers summarize the event as follows: “Celtic Music, crafts for the kids, heavy events championships, bagpipes, drums, author appearances, bands, Highland dancing, story telling, singing, clan information and heritage, beer tents, artisans and vendors …. Pipe Band Competitions, Military Tattoo, Highland Dancers. Fergus is also home to the Fergus Highland Rugby Football Club. The club plays in the Ontario Rugby Union, and has two Men’s teams, two Women’s teams and a strong and growing junior program. Fergus Curling Club, Ontario’s oldest continuously running Curling Club, was founded in 1834 by settlers from Scotland. Adam Fergusson was the first president. Matches were held outdoors until 1879 when an indoor rink was opened. St Andrew Street runs parallel to the Grand River (on its north side) and is the heart of downtown. In addition to stores and restaurants, the Fergus Grand Theatre is located here, on the south side of the street. Originally a cinema that opened in 1928, the venue now hosts live entertainment and stage plays. On the south side of the river is Queen Street where the Fergus Market on the River (no longer a farmers’ market) houses shops located in restored historic warehouses. The Wellington County Museum and Archives and the Wellington County library are in nearby Aboyne, halfway between Fergus and Elora. The museum is located in a two-storey Italianate-style stone building on a former working farm. The building is the oldest known state- supported poorhouse or almshouse in Canada. It was called the House of Industry and Refuge when it opened in 1877. Subsequently, the home switched to caring for the elderly and chronically ill, eventually closing in 1971. The building was designated a National Historic Site of Canada in 1995. The Centre Wellington Community Sportsplex completed renovations in the fall of 2006. It now includes a 25-metre indoor swimming pool and a second ice rink to complement the previously existing ice facilities. The facility is now home of the Fergus Force Jr. A Hockey Club (www.fergusforce.com). The Force will play in the Greater Metro Jr. A Hockey League (www.gmhl.net), an independent junior league established in 2006, and known for its unlimited import rule, allowing teams to sign players from all over the world. 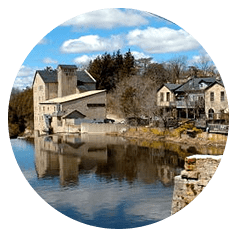 Nearby attractions include the Elora Gorge, Elora Quarry Conservation Area, the Elora Cataract Trailway for hiking, the County Museum and Elora Gorge Falls in addition to Grand River Raceway. Users of the TripAdvisor web site recommend the nearby Belwood Lake Conservation Area, the Fergus Grand Theatre for live performances, Grand River Troutfitters and the Wellington Artist’s Gallery and Art Centre. Restaurants that are highly rated by users include Brewhouse On The Grand, Fergus Tandoori Grill, Ikiru Sushi, My Kitchen by Gancena and the Bentley House Fine Teas & Tea Room. If you come to Fergus for a visit, you might just decide to stay. Elora is a community in the township of Centre Wellington, Wellington County, Ontario, Canada. Elora is no longer an independent entity. In 1999, the Township of Centre Wellington was formed by amalgamating the Town of Fergus, Ontario, Village of Elora and the Townships of Nichol, Pilkington, West Garafraxa and a part of Eramosa. Many tourists visit Elora on day trips, attracted by the historic nature of the town or the Grand River Raceway with horse racing and slot machines. 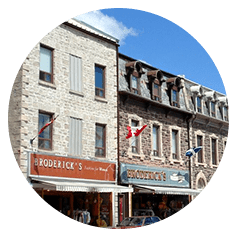 It has many small shops, pubs, cafés, restaurants, including its own brewery known as the Elora Brewing Co. and art galleries. These are often in buildings from the mid 19th century. The Gorge Cinema is Canada’s oldest continuously running repertory theatre. The annual Elora Festival & Singers event is particularly popular; the headliner in 2017 is Gordon Lightfoot. The Elora Mill Inn & Spa is undergoing substantial renovations and should reopen in the summer of 2018. The Elora Gorge and its Conservation Area are at the edge of town. The park offers canoeing, paddleboat rentals, hiking, camp-grounds, fishing and picnicking. Some of the limestone cliffs are 80 feet high. At the eastern end of the village is the Elora Quarry Conservation Area, a scenic former limestone quarry, is now a popular swimming area. The gorge has the architecturally significant David St. Bridge; it was saved from destruction by active citizens. Restored buildings on Water St., (shops and restaurants), line the Grand River in the downtown area. In 2001, a group of citizens organized to develop a century school, whose headmaster had been at one time David Boyle who was well known as an educator in the late 1800s, into an arts and cultural centre, the Elora Centre for the Arts. The township of Centre Wellington has an active historical society and operates the Wellington County Museum and Archives in a historic stone building in Aboyne, halfway between Elora and Fergus, Ontario. This two-storey Italianate-style stone building was the oldest known state-supported poorhouse or almshouse in Canada, called the House of Industry and Refuge when it opened in 1877. The museum opened in 1975 and the building was designated a National Historic Site of Canada in 1995. If you come to Elora for a visit, you might just decide to stay.